Everyday through Tuesday (9/25), Munchkin will be giving away 2-packs of their sippy cups to the first 100 people. To enter, wait until 9am (Pacific Time)/ Noon (Eastern Time) and click here to like them on facebook. Then on the “Free Cups” tab, just fill out the form. According to their facebook, winners will be notified by email around September 28th. Please and thank.can really use. my daughter absolutly loves these cups!! Thank you Sam for what you do and I really enjoy the samples. would love to have for my son, we need something new. Its an hour before the time your saying and my application went through o.0 know I don’t know if the time is open or if they are being sneeky and letting application go through but only look at the ones coming in at the times above -_- great! 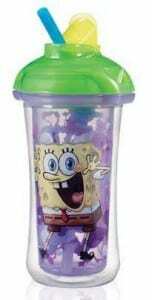 i like this cups for my kid’s..
Grandkids love these cups and spongebob! Yes, please. My niece loves sippys. My daughter loves these sippy cups!!!! I love the hello kitty munchkin cups ! My kids and nieces and nephews love these cups when they visit. My grandaughter would love these,she watches sponge bob all the time. my lil’monkey would just adore these cups. I would love to get a sippy cup for my grandson!! He would love it!! Would love a sippy cup! Thank you for the opportunity!